Out of all the triadmovies from Hong Kong, I've consciously choosen to sample the works with more maturity or those daring to take the genre into fresh places, whether it's for spoof purposes or, in this case, into a darkly comedic direction. Too Many Ways To Be No.1 was the second pairing between acting gods Francis Ng and Lau Ching Wan in 1997 (other being the totally different, in tone, Full Alert) and also Wai Ka-Fai's second movie as director (first was the stylish but ultimately uneven Peace Hotel). A gang of lowlife triads manages to, even before they start, screw up a car deal with the Mainland Chinese triads. Trying to remedy the situation and get back on their feet only brings them more trouble and their journey ends in violence. Our main character Kau (Lau Ching Wan) really choose the wrong path here. What would happen if he had gone to Taiwan with Matt (Francis Ng) to kill a triad boss instead? During the latter part of the 90s Milkyway was THE production house that infused Hong Kong cinema with the best inventive aspects. Today, in 2003, it's is tougher for Johnnie To and Wai Ka-Fai to get funding for their real movies.. All these romantic comedies of theirs is largely an attempt to gather funds for the movies they REALLY want to do. It isn't like Too Many Ways To Be No.1 has a huge budget but it's indicative of what Milkyway did and was going with Hong Kong cinema. Director Wai Ka-Fai puts us right smack in the middle of bizarre, gory and damn funny situations but looking at it, it still has the basic ingredients of the triad movie. The execution however is far from what anyone had ever done with the genre though, even borderlining on great parody at times. Too Many Ways To Be No.1 is a big step forward for the director and even the unprepared viewer (in terms of hype, beforehand knowledge of the film etc.) will find his second movie rewarding. The key structure of the film isn't apparent until very late and is basically divided into two episodes. One telling the tale of what happens if you take a left and the other if you take a right, neither way a very ideal choice for these triads. A bunch of incredibly, wonderful stupid triads. Wai's motto while shooting must've been: 'There's no such thing as too much steadycam'. He's decided to take us on a wild, wacky ride and what better way to do that than to literally shake things around a bit. Wai Ka-Fai, in the first episode, really throws buckets of dark, gory comedy at us and from seeing that, I was hooked on this movie. 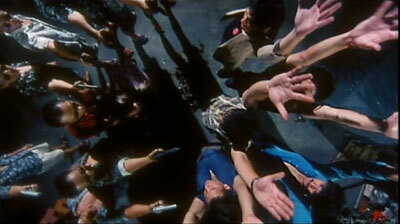 Because, in my view, the best portrayal of Hong Kong triads is when they're seen as complete fools. Some have no way of hiding it and some adopt a cool exterior, which only makes it more apparent. When it comes down to it, these guys have no clue and their combined intellect is what gets them into so much trouble in the first place. Troubles that involves death and dismemberment among other things. Just look at the scene where they bury their friend with his pager or when one of them observes that a fish just took a poo in the aquarium water. I rest my case. The pace is frenetic, to put it mildly, but Wai Ka-Fai slows things down right at the end of the first episode. Back at square one, viewer may feel slightly confused but you'll quickly understand that we're now seeing an alternative chain of events. Not surprisingly the alternate choice gets our character into deep, dark trouble again but not as rapidly as the first time. Wai could've opted to be even more manic in the pace department but decides to, for this second act, to slow things down, making the movie arty almost. The laughs may not come as thick and fast but it's still greatly entertaining. It's unlike anything you Young & Dangerous-fans will ever witness but it's still in tune with the Milkyway tradition to a certain extent. This wild camera language actually is very compelling and DP Wong Wing-Hung (also shot Wai's debut) gets the opportunity to shoot some very unconventional scenes. Scenes where the camera is placed pretty much everywhere and anywhere. It's on tables (fish eye style), up in the roof of rooms, right in the middle of people running around and even upside down at one point! Is there a justified purpose for this free for all way of shooting? Normally, I would have to say no because I see steadycam as a lazy man's tool. There are select few movies though where, like in Too Many Ways To Be No.1, a quirky, comedic mood is employed and the camera language works very well along with it. It becomes part of creating that mood and not a distraction working against creating it. 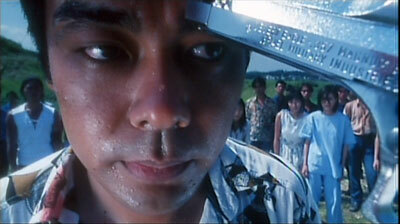 Lau Ching Wan probably starred in more Milkyway productions than any other actor from this point and onwards. In both halves of Too Many Ways To Be No.1 he plays the same character but he does change between acts. At first, he's the bullied triad but has to become the decisive and thinking one in the Taiwan part of the story. In both stories he is the only one expressing himself, in terms of what he's doing with his life and how he's not pleased where he's ended up at age 32. That makes for a nice serious touch that does actually blend with the crazy nature of the film. With Lau you rarely get a bad performance and he acts out these opposite sides like the great veteran he is. For Francis Ng, playing Matt, the same switch in character happens between stories. While still part of the stupid gang of triads, he's at first more the head of the bunch and the one you would perceive as dangerous. Enter the second story and that arc is seriously turned upside down. Here he is a coward and displays all matter of clumsy, irrational behaviour (including robbing an old woman just because he's hungry). Kau really has to babysit this one. Francis plays partly what he's been seen doing before but it's when he becomes the cowardly Matt that he is at his zany best. Matt is completely stressed out, annoyingly shouts (my favourite bit is his difficult phone conversation with a senile relative of his), no use to anyone and Francis really has fun doing performing all that. When he puts in effort, few can rival him. Wai Ka Fai's Too Many Ways To Be No.1 is an assault of weird, wild wackiness but it's a thoroughly entertaining ride. With all this content I wonder if it really can be qualified as part of this genre of movies but it does have what I'm looking for; New and fresh execution of previously seen ideas. City Laser's dvd is currently out of print but it's an above average presentation....if you compare it to a Widesight release. It's framed 1.85:1 and features minimal print damage. Only during, what I assume is, reel changes the picture becomes filled with specks. Colours are bit subdued and in places a bit of darkness lies over the print. The Cantonese 2.0 track (has Mandarin dialogue scattered throughout as well) has all the sound coming out of the centre speaker but sounds adequate. Dialogue is nicely presented and each part of the mix doesn't overpower the other. A Mandarin 2.0 dub is also included. The English subtitles are burned in but pretty much error free and readable all throughout. Only one scene had extensive white underneath it, resulting in the subs being a bit hard to read. No extras on the disc.